Northern spotted owl in the Olympic Mountains. Photo by Rod Gilbert. The northern spotted owl is one of three spotted owl subspecies found in North America. A species with dark eyes and no ear tufts (Figure 1), the spotted owl is about 18 inches from head to tip of tail and has a wingspan of about 41 inches. Females are slightly larger than males (Gutiérrez et al. 1995). Most of its feathers are a moderate shade of brown, with light-colored “spots” on the head, back, wings, and belly. Horizontal brown bands across buff-colored feathers on the belly help to distinguish this species from the closely- related barred owl (S. varia) which has vertical bars on the belly. The spotted owl is distributed from extreme southwestern British Columbia south to central coastal California. In Washington, it is found throughout much of the Olympic Peninsula, on both slopes of the Cascade Range and, rarely, in remnant patches of mature or structurally complex forest in the Puget Trough and southwestern Washington (Figure 2). It is found at elevations from near sea level on the Olympic Peninsula to about 1,555 m (5,100 feet) in the Cascade Range. All parts of its range are characterized by the presence of coniferous forest. Spotted owls are strongly associated with structurally complex forest. Such forests are generally old growth, but the owls also use mature and some younger-aged forests. Sites as young as 50 years that contain remnant large-diameter trees or snags that survived, or were created by, a previous disturbance (e.g. fire, wind storm, or, in some cases, timber harvest) are sometimes used (Gutiérrez et al. 1995, Courtney et al. 2004). Forests used by spotted owls in the eastern Cascade Range tend to be younger than forests used elsewhere in Washington, and owls in those areas nest in abandoned northern goshawk (Accipiter gentilis) nests or clumps of branches infected by mistletoe (Buchanan et al. 1993), in contrast to the typical use of snags and cavity trees elsewhere in the state. The most important habitats support all spotted owl life requisites, whereas some of them provide only certain resources, such as prey, and not others, such as nest sites. Spotted owls in Washington have the largest home ranges in the species’ range (up to 27,679 acres), with substantial amounts of habitat used to hunt for prey (Forsman et al. 2005). Spotted owls primarily prey on small mammals; the most important prey species in Washington is the northern flying squirrel (Glaucomys sabrinus) and various other small mammals are also taken (Forsman et al. 2001). 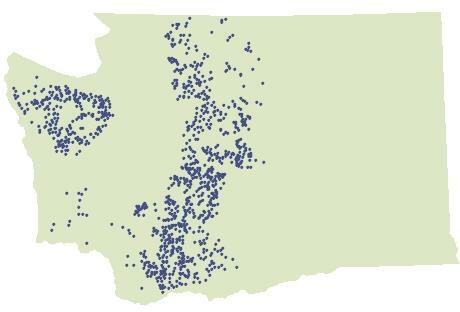 WDFW maintains a database of spotted owl sites in the state. There were 1,070 territorial sites known to have been occupied by spotted owls in at least one year between 1976 and 2011 (Figure 2); results from recent demographic research (Forsman et al. 2011) suggested that many of these sites are no longer occupied. Information contained in the database was collected over many years by researchers, state and federal agencies, the wood products industry, tribes, and environmental groups. Some sites have not been monitored for many years (>15 years) and others have been impacted by disturbance events (e.g. fire, timber harvest) to the extent that they may no longer be used by spotted owls. As is true throughout its range, the absolute size of the spotted owl population in Washington is not known. In contrast to knowledge of population size, there is information on the spotted owl population trend in Washington. Demography research projects were initiated in Washington in the 1980s in four large landscapes: the vicinity of Cle Elum in the eastern Cascades, a larger area of the eastern Cascade Range, the Olympic Peninsula, and Mt. Rainier and vicinity (Anthony et al. 2006). The larger eastern Cascade Range project was discontinued, but the others are ongoing. Results from the four studies have demonstrated population declines through 2004 (Anthony et al. 2006). The most recent analysis for the three Washington study populations through 2008 indicated declines of 4.3 to 7.1% (Forsman et al. 2011; Figure 3). Population declines have also been documented in parts of Oregon and California (Forsman et al. 2011), and the species is nearly extirpated in British Columbia (Fenger et al. 2007; I. Blackburn, pers. comm.). Habitat loss. The two most important limiting factors affecting spotted owls in Washington are habitat loss and competition with barred owls (Courtney et al. 2004). Habitat loss has occurred as a result of forest conversion, timber harvest, fire, windthrow, insect outbreak and disease. The eruption of Mount St. Helens also destroyed large areas of forest that was probably spotted owl habitat. Substantial areas of forest, particularly in the lowlands of western Washington, were intensively managed over the last century, especially following the development of modern clear cut harvest methods after World War II. Much of the lowland area remains in forest, but large areas have also been converted to urban and suburban environments that do not provide habitat for spotted owls. Habitat loss from timber harvest has continued both in lowland and mid-elevation areas on public and private industrial forest lands (e.g. Pierce et al. 2005). Fire and wind events have destroyed or altered spotted owl habitat in areas throughout the range of the species. In Washington, one of the most significant wind events was a 1921 cyclone (Mass and Dotson 2010), now locally referred to as the “21 blow.” That event impacted many thousands of acres of forest in the western parts of the Olympic Peninsula. Impacts ranged from very minor to areas of complete blowdown; present-day patches of 90-year old forest with residual older trees are the result of partial impacts and these patches generally function as spotted owl habitat. Habitat loss from fire has occurred in both western and eastern Washington. Two fires in Olympic National Park burned spotted owl habitat in the last two decades. Several fires in the southern and central parts of the eastern Cascade Range have burned habitat in about 20 spotted owl territories since 1994 (e.g. Bevis et al. 1997, Gaines et al. 1997). The intensity and impact of these fires appears to have been exacerbated by the effects of decades of fire suppression in the dry forest landscape (Spies et al. 2009; see Hanson et al. 2009 for a different perspective). Insect outbreaks can also impact spotted owl habitat. A large ongoing outbreak of spruce budworm in the eastern Cascade Range affected large patches of spotted owl habitat in and near the Teanaway River Basin in Kittitas County. Competition with barred owls. The barred owl has recently expanded its range into the Pacific Northwest and northern California and is now found throughout most of the northern spotted owl’s range (Dark et al. 1998). Barred owls first entered the Pacific Northwest in Washington and they are believed to be more common here than in other parts of the northern spotted owl range. The greatest spotted owl population declines have been reported from Washington and northern Oregon, and rates of negative population change were generally lower in southern through Oregon and northern California (Forsman et al. 2011). The gradient of spotted owl population decline from north to south appears to coincide with a regional gradient in barred owl abundance. In contrast to spotted owls, barred owls are habitat and prey generalists, use smaller home ranges, have greater dispersal ability, and appear to have greater reproductive rates (Mazur and James 2000). Barred owls also appear to be behaviorally dominant over spotted owls (Courtney et al. 2004, Wiens et al. 2011). When barred owls first entered the range of the spotted owl they were more often found in forested valleys and areas near water (J. Buchanan, pers. obs. ), which is consistent with their use of habitat in eastern North America (Mazur and James 2000). In the decades since their arrival, the species has moved into other, dryer and upslope forests (Gremel 2005, J. Buchanan, pers. obs. ), although some upslope areas appear not to be used at present (Singleton et al. 2010, B. Pearson, personal communication). Surveys. Surveys are conducted for purposes such as demography research and assessment of occupancy by owls in or near proposed timber harvests. Two recent investigations provide insight into aspects of survey methods. Kroll et al. (2010) found that spotted owl vocalization rates were lower at sites where barred owls were present than at sites where barred owls had not been detected. This information was used to inform changes to the U.S. Fish and Wildlife Service survey protocol. In addition, Wasser et al. (2012) used specially trained dogs to search for spotted owls and found that the dogs’ ability to correctly distinguish between spotted owl and barred owl pellets increased the probability of detecting spotted owls by about 30% compared to standard survey methods based on broadcasts of owl vocalizations. This study has the potential to dramatically improve survey efficiency, particularly at sites where spotted owl response rates to traditional survey efforts are low. Climate change. Climate change may affect spotted owl habitat in the future. A recent overview indicates that species composition and forest productivity of Washington forests will change, as will the size and severity of fires and the prevalence of insects and disease problems (Littell et al. 2009). Depending on the magnitude of these changes, habitat or prey of spotted owls might be influenced. Proactive dry forest management in the eastern Cascade Range that reverses some of the effects of historical fire suppression, should moderate some of these concerns in that portion of the owl’s range (Franklin et al. 2008). A new initiative lead by investigators from the U.S. Geological Service Northwest Climate Science Center and other partners will evaluate potential effects of climate and land management on future vegetation structure and how these changes might influence spotted owls in coastal Washington. WDFW is providing technical support for this project. Addressing threats to spotted owls. A 2008 federal recovery plan for the northern spotted owl was revised in 2011 (U.S. Fish and Wildlife Service 2011). The revised plan recommends achieving recovery of the spotted owl through: 1) the retention of more occupied and high-quality habitat; 2) active management using ecological forestry techniques, both inside and outside of reserves; 3) increased conservation of spotted owls on state and private lands; and 4) the removal of barred owls in areas with spotted owls. It also recommends retaining a reserve network of habitat while the Service utilizes a habitat model to develop and propose a new critical habitat network for the spotted owl. In May 2012, the U.S. 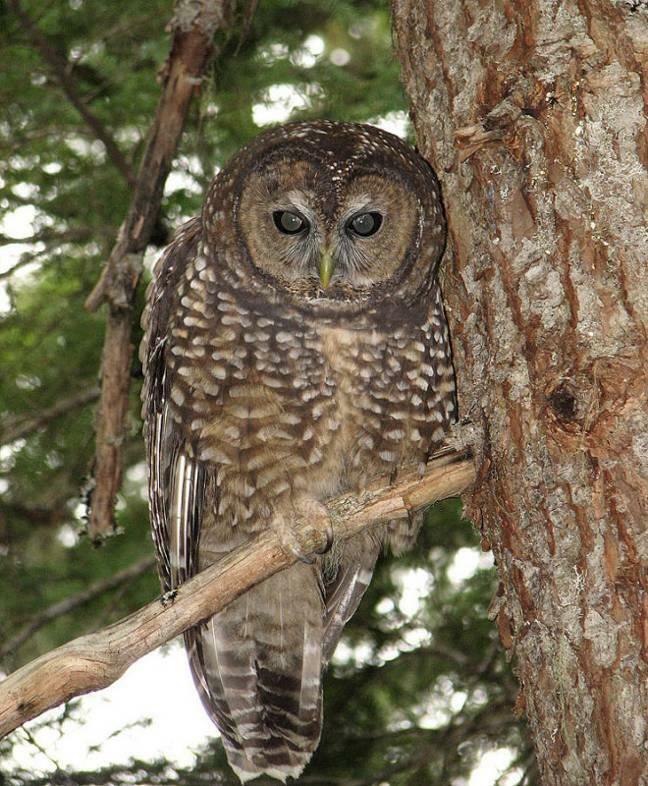 Fish and Wildlife Service released two proposals related to northern spotted owl recovery. These are: 1) a proposed revised critical habitat designation for the spotted owl (U.S. Fish and Wildlife Service 2012a); which was subsequently implemented; and 2) a draft environmental impact statement on experimental removal of encroaching barred owls from certain portions of spotted owl habitat (U.S. Fish and Wildlife Service 2012b). The removal experiment has yet to be implemented. Other initiatives to address habitat threats include the formation of a Dry Forest Working Group convened by the Service to address fire risk to spotted owl habitat in dry forest landscapes. The Washington Forest Practices Board convened a Northern Spotted Owl Implementation Team to recommend incentives for private landowners to provide spotted owl habitat and assist with other conservation efforts. A technical team that reports to the Northern Spotted Owl Implementation Team was also formed to identify potential landscapes where incentives might be optimized, from both ecological and economic perspectives. WDFW participates on both of these teams. State and private timber entities have developed habitat conservation plans for spotted owls in Washington; most of these plans have been in place for a decade or more (Buchanan and Swedeen 2005). In addition, two industrial forest management companies have developed Safe Harbor Agreements since 2009. Partners and cooperators: Common Futures, Conservation Biology Institute, Earth Economics, EcoTrust, EcoNorthwest, Institute for Natural Resources, National Park Service, Oregon State University, Portland State University, Raedeke Associates, Seattle Audubon Society, U.S. Fish and Wildlife Service, U.S. Forest Service, U.S. Geological Survey, University of Washington, Washington Department of Natural Resources, Washington Forest Law Center, Washington Forest Protection Association and member companies, Yakama Indian Nation. Anthony, R.G., E.D. Forsman, A.B. Franklin, D.R. Anderson, K.P. Burnham, G.C. White, C.J. Schwarz, J. Nichols, J.E. Hines, G.S. Olson, S.H. Ackers, S. Andrews, B.L. Biswell, P.C. Carlson, L.V. Diller, K.M. Dugger, K.E. Fehring, T.L. Fleming, R.P. Gerhardt, S.A. Gremel, R.J. Gutiérrez, P.J. Happe, D.R. Herter, J.M. Higley, R.B. Horn, L.L. Irwin, P.J. Loschl, J.A. Reid and S.G. Sovern. 2006. Status and trends in demography of northern spotted owls, 1985–2003. Wildlife Monograph 163:1-48. Bevis, K.R., G.M. King, and E.E. Hanson. 1997. Spotted owls and 1994 fires on the Yakama Indian Reservation. Pages 117-122 in J.M. Greenlee, editor. Fire effects on rare and endangered species and their habitats. International Association of Wildland Fire, Fairchild, Washington. Buchanan, J.B., L.L. Irwin, and E.L. McCutchen. 1993. Characteristics of spotted owl nest trees in the Wenatchee National Forest. Journal of Raptor Research 27:1-7. Buchanan, J.B. and P. Swedeen. 2005. Briefing report to the Washington State Forest Practices Board on spotted owl status and Forest Practices Rules. Washington Department of Fish and Wildlife, Olympia, Washington. Clark, D.A., R.G. Anthony, and L.S. Andrews. 2011. Survival rates of northern spotted owls in post-fire landscapes in southwest Oregon. Journal of Raptor Research 45:38-47. Courtney, S.P., J.A. Blakesley, R.E. Bigley, M.L. Cody, J.P. Dumbacher, R.C. Fleischer, A.B. Franklin, J.F. Franklin, R.J. Gutiérrez, J.M. Marzluff, and L. Sztukowski. 2004. Scientific evaluation of the status of the northern spotted owls. Sustainable Ecosystems Institute, Portland, Oregon. Dark, S.J., R.J. Guttiérrez, and G.I. Gould, Jr. 1998. The barred owl (Strix varia) invasion in California. Auk 115:50-56. Fenger, M., J.B. Buchanan, T.J. Cade, E.D. Forsman, S.M. Haig, K. Martin, and W.A. Rapley. 2007. Northern spotted owl population enhancement and recovery in British Columbia: proposed five-year action plan. Prepared by the Spotted Owl Population Enhancement Team for the government of British Columbia, Victoria, British Columbia, Canada. Forsman, E.D., K.M. Dugger, E.M. Glenn, A.B. Franklin, G.C. White, C.J. Schwarz, K.P. Burnham, D.R. Anderson, J.D. Nichols, J.E. Hines, J.B. Lint, R.J. Davis, S.H. Ackers, L.S. Andrews, B.L. Biswell, P.C. Carlson, L.V. Diller, S.A. Gremel, D.R. Herter, J.M. Higley, R.B. Horn, J.A. Reid, J. Rockweit, J.P. Schaberl, T.J. Snetsinger, and S.G. Sovern. 2011. Population demography of northern spotted owls. Studies in Avian Biology 40:1-120. Forsman, E.D., I.A. Otto, S.G. Sovern, M. Taylor, D.W. Hays, H. Allen, S.L. Roberts, and D.E. Seaman. 2001. Spatial and temporal variation in diets of spotted owls in Washington. Journal of Raptor Research 35:141- 150. Forsman, E.D., T.J. Kaminski, J.C. Lewis, K.J. Maurice, S.G. Sovern, C. Ferland, and E.M. Glenn. 2005. Home range and habitat use of northern spotted owls on the Olympic Peninsula, Washington. Journal of Raptor Research 39:365-377. Franklin, J.F., M.A. Hemstrom, R. Van Pelt, and J.B. Buchanan. 2008. The case for active management of dry forest types in eastern Washington: perpetuating and creating old forest structures and functions. Washington Department of Natural Resources, Olympia, Washington. Gaines, W.L., R.A. Strand, and S.D. Piper. 1997. Effects of the Hatchery complex fires on northern spotted owls in the eastern Washington Cascades. Pages 123-129 in J.M. Greenlee, editor. Proceedings – Fire effects on rare and endangered species. International Association of Wildland Fire, Fairchild, Washington. Gremel, S.A. 2005. Factors controlling distribution and demography of northern spotted owls in a reserved landscape. MS thesis. University of Washington, Seattle, Washington. Gutiérrez, R.J., A.B. Franklin and W.S. LaHaye. 1995. Spotted owl (Strix occidentalis). in A. Poole and F. Gill (editors), The birds of North America, No. 179. The Academy of Natural Sciences and The American Ornithologists’ Union, Washington, D.C.
Hanson, C.T., D.C. Odion, D.A. Dellasala, and W.L. Baker. 2009. Overestimation of fire risk in the northern spotted owl recovery plan. Conservation Biology 23:1314-1319. ICF Jones & Stokes. 2009. Safe Harbor Agreement, Landowner Option Plan, and Cooperative Habitat Enhancement Agreement: Port Blakely Tree Farms, Morton Block (ICF J&S 00209.07), Olympia, Washington. Prepared for Port Blakely Tree Farms, L.P.
Kroll, A.J., T.L. Fleming and L.L. Irwin. 2010. 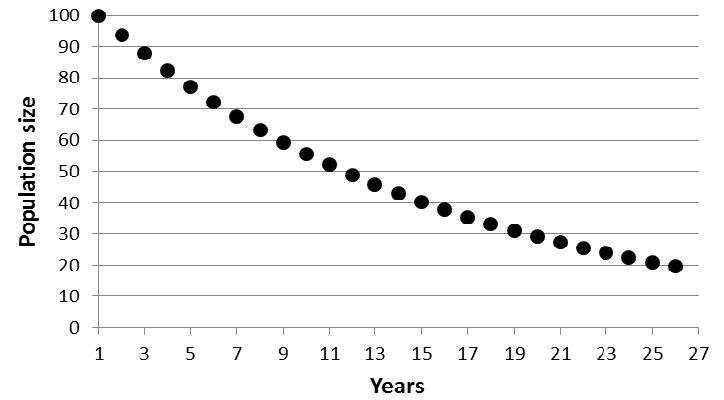 Site occupancy dynamics of northern spotted owls in the eastern Cascades, Washington, USA, 1990-2003. Journal of Wildlife Management 74:1267-1274. M.M. Elsner, L.C. Whitley Binder, and A.K. Snover, editors. The Washington climate change impacts assessment: evaluating Washington’s future in a changing climate. Climate Impacts Group, University of Washington, Seattle, WA. Available at: http://cses.washington.edu/cig/outreach/waccia/. Mass, C. and Dotson. 2010. Major extratropical cyclones of the northwest United States: historical review, climatology, and synoptic environment. Monthly Weather Review 138:2499-2527. Mazur, K.M. and P.C. James. 2000. Barred owl (Strix varia). In A. Poole and F. Gill, editors. The birds of North America, No. 508. The Academy of Natural Sciences and The American Ornithologists’ Union, Washington, D.C.
Pearson, R.R. and K.B. Livezey. 2003. Distribution, numbers, and site characteristics of spotted owls and barred owls in the Cascade Mountains of Washington. Journal of Raptor Research 37:265-275. Pierce, D.J., J.B. Buchanan, B.L. Cosentino, and S. Snyder. 2005. An assessment of the status of spotted owl habitat on non-federal lands in Washington between 1996 and 2004. Washington Department of Fish and Wildlife, Olympia. Singleton, P.H., J.F. Lehmkuhl, W.L. Gaines, and S.A. Graham. 2010. Barred owl space use and habitat selection in the eastern Cascades, Washington. Journal of Wildlife Management 74:285-294. Spies, T.A., J.D. Miller, J.B. Buchanan, J.F. Lehmkuhl, J.F. Franklin, S.P. Healey, P.F. Hessburg, H.D. Safford, W.B. Cohen, R.S.H. Kennedy, E.E. Knapp, J.K. Agee, and M. Moeur. 2009. Underestimating risks to the northern spotted owl in fire-prone forests: response to Hanson et al. Conservation Biology 24:330-333. U.S. Fish and Wildlife Service. 1990. Endangered and threatened wildlife and plants: determination of threatened status for the northern spotted owl. Federal Register 55:26114–26194. U.S. Fish and Wildlife Service. 2011. Revised recovery plan for the northern spotted owl (Strix occidentalis caurina). U.S. Fish and Wildlife Service, Portland, Oregon. U.S. Fish and Wildlife Service. 2012b. Draft Environmental Impact Statement for Experimental Removal of Barred Owls to Benefit Threatened Northern Spotted Owls. Federal Register 77:14036-14039. Wasser, S.K., L.S. Hayward, J. Hartman, R.K. Booth, K. Broms, J. Berg, E. Seely, L. Lewis, and H. Smith. 2012. Using detection dogs to conduct simultaneous surveys of northern spotted (Strix occidentalis caurina) and barred owls (Strix varia). PLoS ONE 7(8): e42892 DOI: 10.1371/journal.pone.0042892. Wiens, J.D., R.G. Anthony, and E.D. Forsman. 2011. Barred owl occupancy surveys within the range of the northern spotted owl. Journal of Wildlife Management 75:531-538.